On 14th July 2017, Quay HR Solutions offered Dorset School and College leaders a free place at a Managing Employee Discipline training event, held at Rubicon Recruitment’s offices in Poole. ACAS state that “many potential disciplinary issues can often be resolved informally. Cases of minor misconduct or unsatisfactory performance are usually best dealt with informally. A quiet word is often all that is required to improve an employee’s conduct or performance”. The training event explored situations where formal and informal resolution may be appropriate, as well as the key steps in the disciplinary process, recognising how a disciplinary procedure could be unfair, and recommending how to handle potential disciplinary cases. With the average cost of defending an employment tribunal claim in 2015 estimated by the CIPD to be £8,500, by resolving disciplinary issues informally Schools and Colleges can save time and money. 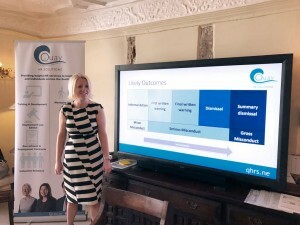 Claire Hyde, Director of Quay HR Solutions Limited says, “I know from past experience that some training sessions can be very didactic, however Shelley made the session very interactive, which helped the delegates to learn”. Claire goes on to say: “The feedback forms really back this up; all attendees said that Shelley’s training created an interactive atmosphere and that all objectives were met”. The event was kindly hosted by Rubicon Recruitment Group, trusted recruitment partner and staffing supplier to numerous successful businesses across the south, at their stunning 16th century Great Chamber in their Poole offices. All delegates were given a feedback form, on which an attendee remarked: “Very good course and would be interested in attending future events”. 100% approval rating was given for the relevance of the course as well as all the objectives being met. Quay HR is now a listed supplier and member of the Edfirst community. Edfirst aims to help Schools source supplies and services using a comprehensive online directory. Quay HR Solutions provides practical business solutions covering the entire employment journey from recruiting staff and writing employment contracts, through managing employee relations and the typical workplace issues that arise during employment, to terminating employment in accordance with employment law. Quay HR also offer a wide range of training sessions, which can be delivered in-house from as little as £180 + VAT. Shelley Poole sets out potential disciplinary outcomes during the event.